A Delightful Dolphin Show at National Aquarium in Baltimore, MI. 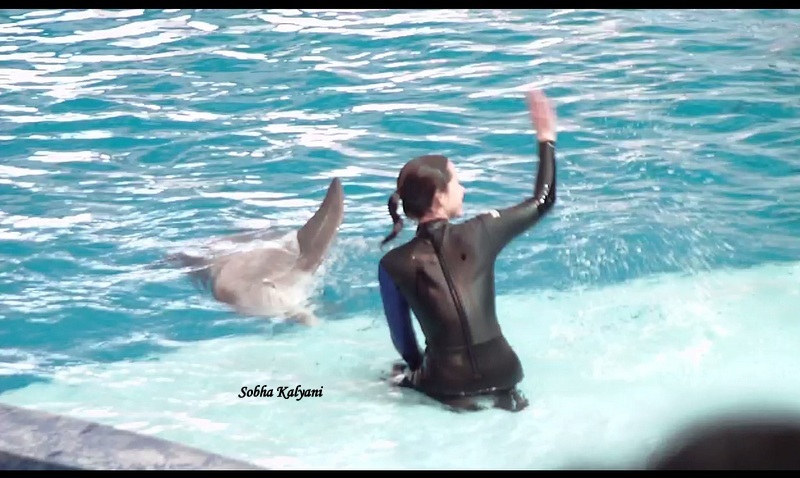 During our visit to Baltimore National Aquarium we got the opportunity to watch the delightful Dolphin show at the aquarium which they called 'Play'. After moving around the exhibits of the aquarium, we walked through the covered bridge to the Dolphin show. The show was of half an hour duration. This is a ticketed show, so we took the tickets and were seated ourselves at a comfortable place in the gallery. Before the show started, there a show on the big TV, about the aquatic life and other important information. As the show was going on the TV, slowly the waters in front moved. 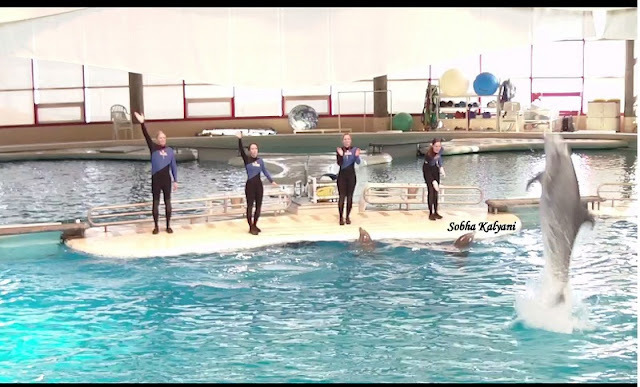 There was a big applause in the audience who shouted in excitement on seeing the bottle nosed dolphin doing some feats in the water. One of the aquarium staffs started giving a brief info on the show. While the audience were busy taking snaps and videos of the lively show. 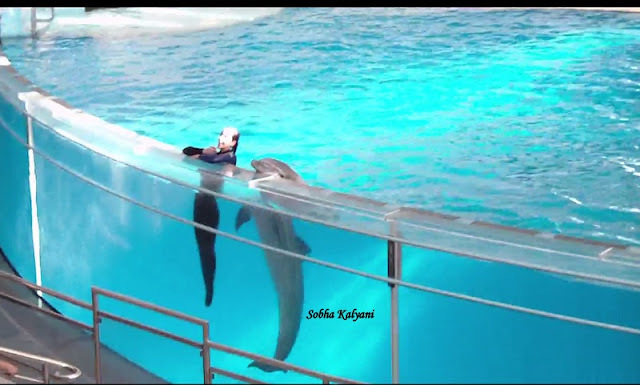 And the pretty dolphins were busy showing their wonderful talent to the spectators who were getting overwhelmed on seeing those. Suddenly there was music all around and the trainers entered with claps. 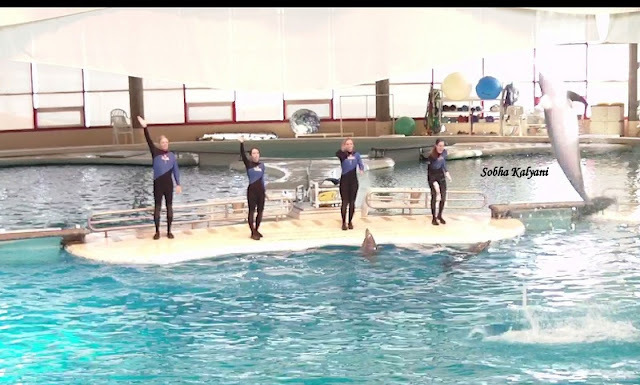 Again there was huge applause from the spectators as the dolphins started performing jumps / feats. The cute lively dolphins started playing with the balls, jumping in the waters. And there was huge applause from the audience. 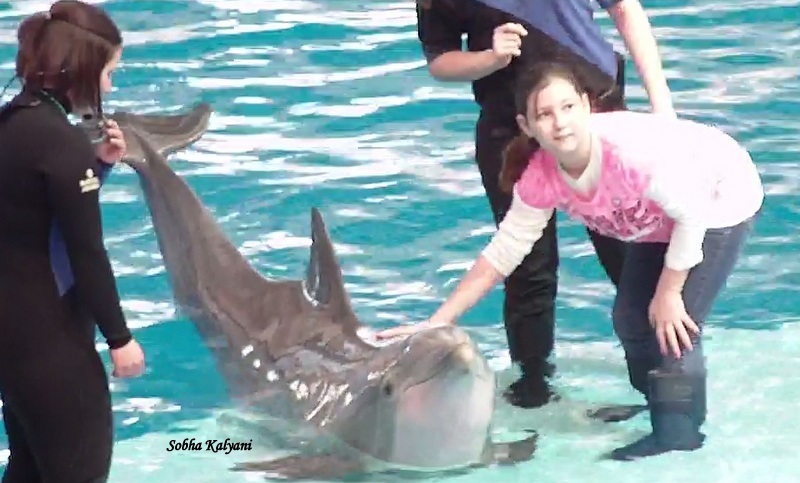 I really enjoyed each and every act of the dolphins along with my 3 years old daughter (now she is 7). 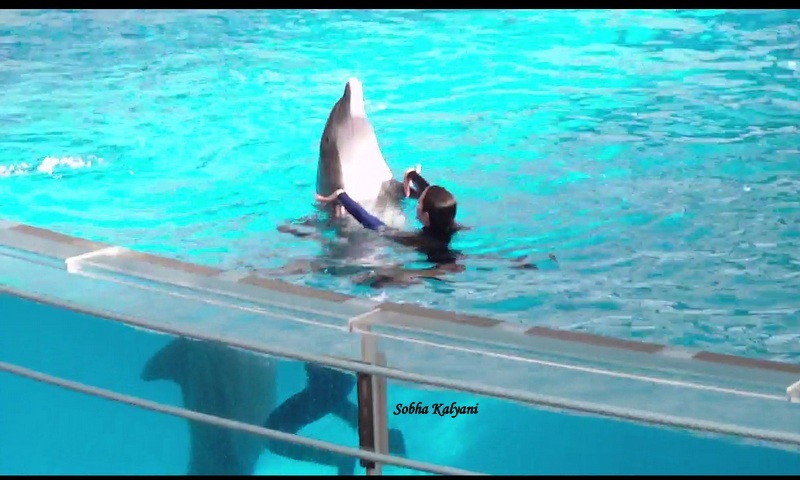 One of the most enjoyed item, you can see the below pic, was the cute dolphin imitating one of the trainers on shore. and in waters. The show was captivating and worth watching. The spell bounding performance of the dolphins who was imitating its trainer. Dolphin show at National Aquarium in Baltimore was a delightful show and was enjoyed the most.